This entry was posted on October 31, 2013 at 12:27 am and is filed under atheism, atheist, Chempaka Lakhsmi, communalism, D. N. Jha, Gyanendra Pandey, heritage, historicity, historiography, history, Irfan Habib, K. M. Shrimalai, R. S. Sharma, Sherin Mosvi. You can follow any responses to this entry through the RSS 2.0 feed. You can leave a response, or trackback from your own site. Leaders of non-Congress, non-BJP parties at “People’s Unity Against Communalism” meeting at Talkatora Stadium in New Delhi on October 30, 2013. NEW DELHI: Fourteen non-Congress and non-BJP parties on Wednesday sought to present themselves as the bulwark against “communalism” ahead of the 2014 Lok Sabha elections although they said the mobilization is not intended to be a “Third Front”. The meeting was attended by Sharad Pawar’s NCP, which with nine MPs is the largest Congress partner in Parliament, along with Left parties and regional outfits like SP, BJD, AIADMK and JD(U). Others included Asom Gana Parishad (AGP), RSP, Jharkhand Vikas Morcha, People’s Party of Punjab (PPP) and Bharipa Bahujan Mahasangh. The congregation is positioning itself as a claimant to political space that regional leaders feel is being vacated by a reduced Congress-led UPA and is clearly a bid to emerge as a decisive factor in the next elections. Calculating that BJP is not poised to fill the vacuum, and eyeing political gains at the expense of a weakened Congress, the parties that gathered at the Talkatora Stadium here presented a strong showing in the cause against communalism. The dynamics at work were evident as Samajwadi Party (SP) chief Mulayam Singh Yadav was a main constituent despite the Uttar Pradesh government being accused of ineptitude and deliberate politics in dealing with the Muzaffarnagar riots. The bonhomie was visible even though former CPI general secretary A B Bardhan bluntly told Yadav that if normalcy has to return to Muzaffarnagar, the SP government in the state should make efforts to send people living in camps to their homes and villages. Tamil Nadu chief minister J Jayalalithaa’s speech read out by AIADMK leader M Thambidurai also struck a different note. She said, “State is often seen to be acceding to pressure of minority demands at one time and majority demands at another time which has fuelled the activities of various people.” She said secularism also does not mean appeasing one section of the society and suppressing the other. Leaders of parties that can cobble up over 100 Lok Sabha seats dropped enough hints that the unity initiative should be extended further. But as of now, they said, talk of a Third Front will be immature. Yet Kumar’s presence was significant in itself as he found himself in the company he had abandoned more than a decade and a half when JD(U) had been an ally of the BJP. His rejoining of likely Third Front constituents has made BJP’s task all that much tougher. BJP predictably came in for some harsh criticism with Kumar and other leaders attacking the saffron outfit and its prime ministerial aspirant Narendra Modi. Inaugurating the convention, noted historian Irfan Habib talked of how during the Partition there were enough instances of Hindu-Muslim amity. But he acknowledged the secular character of the country was hit by events like the 1984 anti-Sikh riots and the 2002 violence in Gujarat where Muslims were at the receiving end of Hindus. CPM general secretary Prakash Karat attacked Modi, “nominee of RSS for the post of PM”, for calling himself a Hindu nationalist. “In our country one can only be a secular nationalist,” he said. Karat pointed out how BJP instead of highlighting the problems of youth, women and working class is engaged in spreading communal tension. “Even secular issues are being given communal colour,” he said. YadavSingh, who has been under attack after the Muzaffarnagar riots, told the gathering that his party’s government in Uttar Pradesh had maintained vigil throughout be it stopping VHP yatra in Ayodhya or other places but still the riots in Muzaffarnagar took place. Yadav said he has faced the brunt of attack for protecting the rights of Muslims. “Some said either Mulayam’s father or mother is a Muslim. I don’t know so many other things have been said about me,” he said, asking secular parties to come together. Bardhan took potshots at the BJP and Modi. He said those trying to build a statue of Sardar Patel should know the first home minister was against the idea of making India a Hindu nation. “They should tell the nation what Patel thought of RSS,” he said. Bardhan said communalism and casteism are companions of imperialism and country should unite against them. NEW DELHI: A day after convention against communalism, CPM said the group of 14 political parties is likely to get enlarged significantly in the future. “It is not a closed list,” CPM weekly People’s Democracy said. CPM also highlighted the way Bihar chief minister Nitish Kumar and Samajwadi Party (SP) leader Mulayam Singh Yadav gave “enthusiastic calls for strengthening unity in the coming days”. The party said that even as the convention was in progress messages came from various parties and groups from across the country that they would like to be associated with such campaigns in the future. The convention, CPM said, reflected the rich diversity and plurality of the Indian social mosaic. “From the former ruling party of Assam, Asom Gana Parishad, to the former chief minister of Jharkhand, the other leaders present, reflected the composite cultural heritage of our country,” CPM said. The principal Left party also accused BJP of misappropriating Sardar Patel with the objective of “re-writing Indian history in order to straightjacket it into a monolithic record of the glorification of the Hindu nation”. CPM said BJP’s effort is integral to advance the RSS project of the metamorphosis of the modern Indian secular democratic republic into their version of Hindu nation. CPM said, “Sharpening of communal polarisation through fascistic demagogy and the triumph of the RSS project will only signal the death of the ideals enshrined in our Republican Constitution”. CPM said the fact that the convention — as was speculated did not result in the formation of non-Congress, non-BJP political alternative — made it clear that its primary objective was to strengthen people’s unity against communalism. The coming together of 14 non-Congress, non-BJP political parties at a “Convention for People’s Unity Against Communalism” here on Wednesday, ahead of next year’s general election, received a muted response from the Congress. If its official response was non-committal, conversations with senior Congress leaders suggested that they were wary of the motives of the leaders of these largely regional parties, even as they made light of the fact that Sharad Pawar’s Nationalist Congress Party was represented at the convention. Faced with this mixed message, two senior Congress leaders told The Hindu separately that while such a gathering helped to articulate the concerns of a vast section against the BJP and other right- wing forces, it also meant that it could help divide the minority vote. “We feel that this move will help the BJP as it could divide the minority votes. None of these parties can hope to win more than a maximum of 30 to 40 seats: it is only the Congress that has the geographical spread to take on Modi and the BJP,” said one leader. Imphal, November 02 2013 : Speaking about increasing instances of communal conflicts in the run up to the next Lok Sabha election 2014, intending CPI candidate and National Executive Member of the party Dr..MNara today told media that the prevailing communal tensions has been generated by the Congress party and BJP. “Hence, such conflicts should be completely removed from the society and this can happen only when the Left Front parties are given a chance in governance,” he said, while addressing a press meet at the office of the party at Irabot Bhavan here today. A good instance of communal riot can be cited of the recent conflicts at Muzaffarnagar, Uttar Pradesh which caused destruction of innocent lives, Dr Nara pointed out. The domain of the ruling parties has resulted in causing many untoward phenomenons across the country, which will increase if they form the government again in the upcoming election. As such the CPI has initiated to form a strong Left block for the Lok Sabha election 2014, he added. Briefing about the participation of N.Mangi, CPI National Council Member and himself at the 3-day National Political Convention held at Talkatora Stadium, New Delhi under the theme “Convention for peoples’ unity and against communalism” which was started on October 28, 2013, Dr Nara informed that the main motive of the convention was to unite the people of the country against communal forces so that people can all live together in a secular and democratic state. The convention was participated by a total of 14 political parties of the country from various states and it resolved to have a left block of non-Congress and non-BJP. Dr Nara further said that if parties like Congress and BJP form the government again in 2014 elections, then common people will suffer as these parties are supported and backed by corporate houses. The Left party will play a key role in the coming Lok Sabha election 2014, he said. Amidst the much-hyped Narendra Modi v/s Rahul Gandhi contest, the coming together of four major regional players and several smaller parties at a Left sponsored convention against communalism here on Wednesday is seen a precursor to the formation of a Third Front. Though, the organisers vehemently deny that there was any plan to form an electoral alliance, the ganging up of regional parties in the name of secularism and also against the Congress has returning the memories of the National Front (NF) and United Front (UF) and , that ruled the country twice in 1989 and later in 1996 respectively. So far not only the Janata Dal (United), Biju Janata Dal, AIADMK and Samajwadi Party — the parties ruling Bihar, Odisha, Tamil Nadu and Uttar Pradesh — have confirmed their participation, but a host of smaller parties like Asom Gana Parishad, Jharkhand Vikas Morcha and chief ministers of Nagaland, Puducherry, Sikkim and Tripura are also attending the day-long convention. Describing talk of a Third Front at this stage a mere media hype, CPI (M) leader Sitaram Yechuri said a concrete front will take shape only after the elections. “Every party will like to fight elections on its own and with full strength to get many numbers as possible,” he said, but admitted that the convention may lead to some political understanding at a later stage. But the primary aim was to consolidate political forces against communalism, he said. 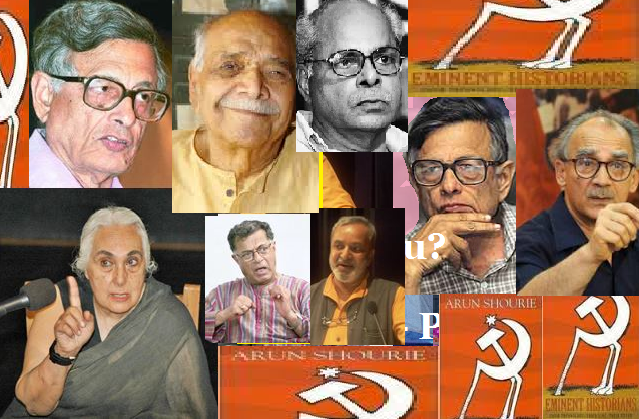 Though, non-Congress secular political players have shown keen interest to join the left sponsored conclave, noted intellectuals with secular credentials are giving it a miss with alibis of health reasons or foreign trip preventing them to attend. They include theatre personality Shyam Benegal, activist and classical dancer Mallika Sarabhai who was among those petitioning the Supreme Court on the 2002 Gujarat riots, and Kannada literature Prof U R Ananda Murthy. 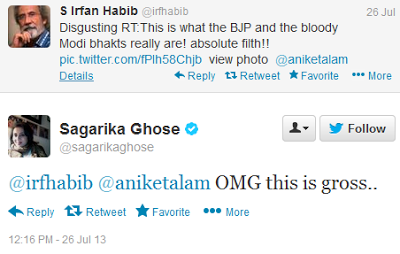 Even Left historian Irfan Habib has excused himself on the health ground. While Samajwadi Party supremo Mulayam Singh an Bihar Chief Minister Nitish Kumar will be attending the convention, two other opposition chief ministers — J Jayalalitha of Tamil Nadu and Naveen Patnaik of Odisha – are sending their parties’ representatives. YSR Congress Party chief Jagan Mohan Reddy has extended support to the convention, but he will be sending either his mother or sister to attend as he can’t attend since he is bound by the bail condition of not going out of Andhra Pradesh. The CPI(M) sources claim half a dozen other regional parties have sent their consent to attend. 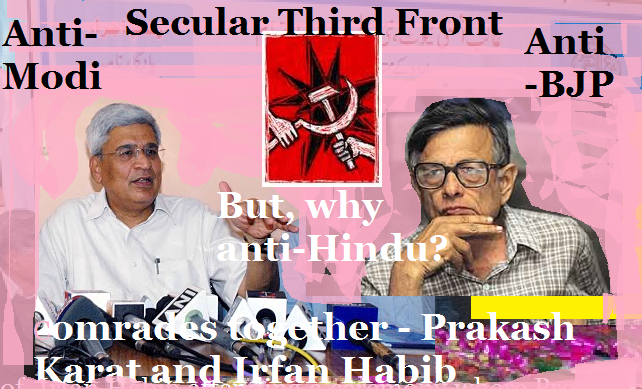 The decision to bring all secular forces on one platform came in a meeting of CPI(M) general secretary Prakash Karat with Mulayam here on October 2. With surveys predicting a bigger role for regional parties after the 2014 parliamentary elections, political circles here said the Third Front players don’t want to repeat the bitter experiences of 1989 and 1996, when they had to form minority governments on the crutches of BJP and Congress respectively, and lasts just for a year in office. “Both the major alliances the UPA and NDA could be in for a surprise. But we would like to wait till the elections are over. And that has been the history of alliances in India. Both the UPA and NDA were sewed up after the polls,” said Sitaram Yechuri. A day after drawing a parallel with Adolf Hitler to his Gujarat counterpart Narendra Modi, Bihar Chief Minister Nitish Kumar said democratic forces should unite “as much as possible” to defeat fascist forces. The JD(U) leader said this while attending a conference for anti-communal where he shared the stage with Samajwadi chief Mulayam Singh Yadav. A week earlier, JD(U) chief Sharad Yadav and CPI(M) leader Sitaram Yechury had announced the ‘Convention Against Communalism and For Unity of People’, in which four Left parties alongside AIADMK, JD(U), SP, BJD, NCP, JD(S), Naga People’s Front, Sikkim Democratic Front, Jharkhand Vikas Morcha and RPI (Prakash Ambedkar) were to participate on October 30. The convention also enlisted as non-political participants of the calibre of film maker Shyam Benegal, Gnanpeeth awardee U R Ananthamurthi, leading danseuse Mallika Sarabhai and eminent historian Irfan Habib. On whether the parties to the convention were planning to form an electoral coalition ahead of the 2014 General Elections, there was no word. Allies until JD(U) broke away from the coalition with BJP, Nitish Kumar and Narendra Modi have started a bitter war of words which in recent times have veered beyond the political and ventured into the personal. On Tuesday, addressing a JD(U) convention, Nitish Kumar coldly criticised Modi for his ‘fascist’ policies. “You (Modi) are telling people ‘chun chun ke saaf karo’ (wipe them out one by one). You can win by getting votes, not by wiping them out… It is not just dictatorship, it is fascism, and those who believe in fascism, their icon is Hitler. They will do what Hitler did… The language of fascism will not work in a democracy,” Kumar had said. Narendra Modi had earlier tore into Kumar at his Bihar rally for snapping ties with the BJP, terming the Bihar a political opportunist who had also left Jayprakash Narayan and Ram Manohar Lohia. “People ask me why my friend left BJP. I tell them those who can stab guru Jayprakash Narayan and socialist leader Ram Manohar Lohia in the back can easily leave long-time friend BJP,” Modi had told a rally in Patna, vowing to oust JD(U) which had quit NDA in opposition with Modi’s elevation as the BJP’s Prime Ministerial candidate. Kumar had taken severe exception to Modi’s accusations, and said that he had never back-stabbed Lohia and Narayan. “When have I deserted JP’s ideology? … Lohia brought parties together to fight the Congress. BJP is walking its own path alone. Where is the comparison?” he had questioned. Kumar had also accused Modi of fabricating facts and politicisng history, making use of historical characters and events as he wished to build support and momentum for his election campaign. Academics from universities in Delhi and Aligarh Muslim University (AMU) have written to President Pranab Mukherjee after former Jamia Millia Islamia Vice-Chancellor Mushirul Hasan quit his post as a teacher at the university recently, alleging harassment by the dean of Faculty of Humanities and Languages. The academics submitted a memorandum to the President, who is also the Visitor of the central university, seeking his intervention, as an academician of high repute and a former Padma Shri awardee was “being subjected to such nefariously calibrated exercises aimed at damaging his credentials by sections of the university and outside”. The group has requested the President to order an inquiry into the episode and also revoke Hasan’s voluntary retirement. The list of signatories include Prof Prabhat Patnaik, Emeritus Professor, JNU, Farah Naqvi, member, National Advisory Council, and Prof Irfan Habib, AMU. 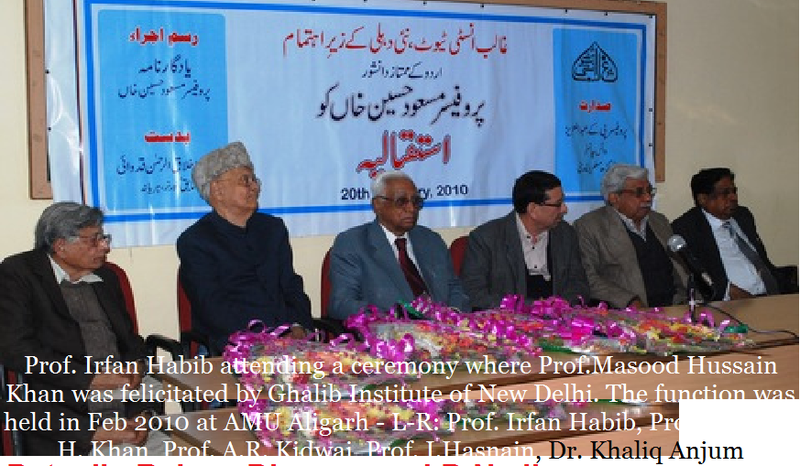 Hasan was the Vice-Chancellor of Jamia Millia Islamia between 2004 and 2009. He went on to head the National Archives of India as the Director-General (2010-2013) and returned to Jamia this summer to teach at the History department. Hasan alleged the Dean of Faculty of Humanities and Languages, G P Sharma, had subjected him to all sorts of harassment. Speaking to Newsline, Sharma had denied the allegations, stating Hasan was not targeted. “I have asked for an explanation from other teachers as well,” he said. THE Convention for People’s Unity and Against Communalism called upon all the secular forces in the country to rise in unison to thwart the dangers posed by communal forces to the unity and integrity of the country. The Convention held in the background of a spate of communal attacks in Muzaffarnagar, Uttar Pradesh, in Rajasthan and in Bihar assumes great significance. 14 political parties took part in the Convention that was attended by a large number of people. Apart from the Left parties – CPI(M), CPI, Forward Bloc and RSP – Samajwadi Party, Janata Dal (United), Janata Dal (Secular), AIADMK, Biju Janata Dal, Nationalist Congress Party, Republican Party of India, Asom Gana Parishad, Jharkhand Vikas Morcha and the People’s Party of Punjab participated in the Convention. The Convention adopted a Resolution calling upon the secular and democratic forces to strengthen their efforts to rebuff the communal forces. The Resolution was read out in Hindi by Ram Gopal Yadav from the Samajwadi Party and in English by Amarjeet Kaur from the CPI. Sitaram Yechury, CPI(M) Polit Bureau member, welcomed the people to the Convention. He said communal forces are increasing their nefarious activities, specially on the eve of the ensuing general elections, to garner benefits. People’s unity must be forged to fight communalism, he said. He moved a resolution of condolence for Rajendra Yadav, well-known writer and intellectual. 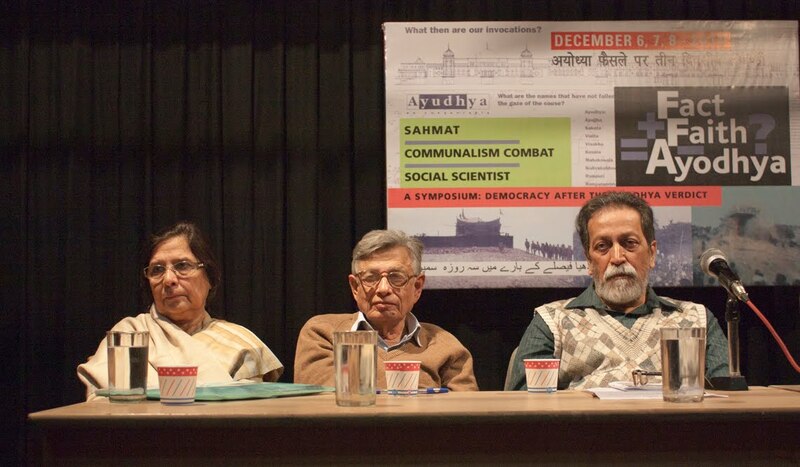 Eminent historian Professor Irfan Habib presided over the Convention. Addressing the Convention, he stressed the importance of coming together of all the leaders with influence on crores of people, on a single platform against communalism. He recalled how the communal forces killed Mahatma Gandhi for trying to see that communal amity is maintained and warned that these very forces are raising their head again. Nitish Kumar, chief minister of Bihar, congratulated the Left forces for taking the initiative to organise this Convention. He said, “We will not tolerate communalism. We are a diverse country. Unity in diversity is our strength. To fight the attack on this foundation of our country, we have all come together.” He underlined that communalism and terrorism thrive on each other. Referring to the recent bomb blasts in Patna, he said terrorist activities are growing in the country. Intolerance to a difference of opinion, to disagreement with a viewpoint, towards diversity which is reflective of fascistic tendencies is rising in the country. Nobel laureate Amartya Sen was defamed because he commented positively about Bihar. Such an attack on democracy is also very dangerous, said Nitish Kumar. Commenting on the speculations about the formation of a Third Front, he said, right now the fight against communalism is most important and all the secular forces have come together and united in a “practically possible” way to fight and defeat the communal forces. Prakash Karat, CPI(M) general secretary, supporting the Resolution, said communal riots across the country are increasing. He questioned why these riots are happening and who is behind them. In the light of the forthcoming general elections, communal issues are being raked up and communal mobilisations are happening, which are leading up to the riots. Pointing out that the BJP’S prime ministerial candidate Narendra Modi has, in an interview recently, said that he is a Hindu nationalist, Prakash Karat said in our country we can only have secular nationalism and called upon the people to defeat the efforts to divide the nation. He said 14 parties with different outlooks and policies, have united to fight the danger of communalism and will together work in the days to come towards this. While there is a severe onslaught on the livelihood of the people under the Congress led UPA government, and while different sections of people including workers, peasants, women, students and youth are all waging struggles against this onslaught, the communal forces are dividing the people on religious lines. Prakash Karat underscored the need for a nationwide campaign for safeguarding the unity of the country. H D Deve Gowda, former prime minister of the country spoke about the opportunities and benefits the United Front government had provided to the Muslim minorities. Mulayam Singh Yadav, SP leader, congratulated the Left for organising the Convention. He said except for the Left support, the SP is single-handedly fighting the communal forces in Uttar Pradesh. He said though they could put a check to the communal activities at various places in Agra, Jhansi, Gorakhpur etc, when the Ayodhya Parikrama was organised by the BJP, they were successful in engineering riots in Muzaffarnagar. He said the SP will strive to defeat the communal forces. A B Bardhan, veteran leader of the CPI, brought to the attention of the Convention how the BJP, which did not participate in the independence struggle of our country, is desperately trying to seek legitimacy by using Sardar Patel’s name. He reminded that it was Sardar Patel who had banned the RSS. Patel had called them mad people, saying that all their speeches are full of hatred for Muslims. Bardhan recalled that the RSS had promised that it would remain as only a cultural organisation, but now they dictate who should be the prime ministerial candidate of the BJP. He urged the people to take the spirit of the Convention to every nook and corner of the country. Thambidurai, AIADMK’s representative read out the message of Tamilnadu chief minister Jayalalithaa’s message to the Convention. Babulal Marandi, former chief minister of Jharkhand and leader of Jharkhand Vikas Morcha, urged the political parties to fight against communalism and also take up the livelihood issues of the people. Prafulla Kumar Mohanta, former chief minister of Assam and leader of Asom Gana Parishad, said such conventions against communalism should be held all across the country. Baidyanath Panda, Biju Janata Dal’s representative read out Odisha chief minister Naveen Patnaik’s message to the Convention. He said it is shameful that communal riots still happen in independent India. Sharad Yadav, JD(S) leader exhorted the audience to take up cudgels against communalism and defeat them. Prakash Ambedkar from the Republican Party of India, Manpreet Badal from the People’s Party of Punjab, Debabrata Biswas from Forward Bloc, Kshitti Goswami from RSP and D P Tripati from Nationalist Congress Party also addressed the Convention. Sitaram Yechury placed the Resolution before the Convention for adoption. It was unanimously adopted. THE hugely successful Convention calling for people’s unity against communalism gave a clear and unambiguous call for protecting the secular democratic character of the Indian Republic from the relentless assaults that are being mounted by the communal forces, as the essential prerequisite for an alternative policy trajectory necessary for the progress of the country and the well-being of the people. Apart from the leaders and representatives from fourteen political parties that attended the Convention, various renowned intellectuals have associated themselves with the objectives of this Convention. 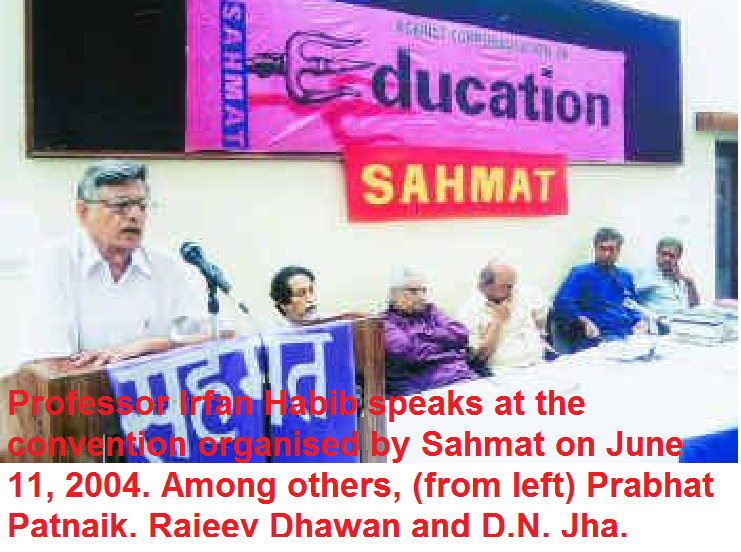 The fact that the Convention was inaugurated by one of India’s most renowned historians and accomplished scholar, Prof Irfan Habib, by itself sent the message that the unique evolution and growth of the `idea of India’ cannot be allowed to be thwarted by the communal forces. The message of the Convention was loud and clear – carry forward this call for people’s unity against communalism all over the country through such conventions and other mass mobilisations. The Resolution adopted by the Convention had given such a call and all the parties present along with an enthusiastic participation that overflowed the Talkatora Indoor Stadium endorsed it with not merely a show of one hand but with both! Further, as the Convention was in progress, messages kept pouring in from various parties and groups from across the country that they would like to be associated with such campaigns in the future. The presence of a UPA ally, Nationalist Congress Party (NCP), also sent the message that the parties represented at the Convention was not a `closed’ list and will most likely enlarge significantly in the future. This was further buttressed by the fact that representatives of regional parties from India’s two most populous states – UP and Bihar – who are currently in government and from two other important states – Odisha and Tamilnadu – gave enthusiastic calls for strengthening such unity in the coming days. The cross section of the parties present in fact reflected the rich diversity and plurality of the Indian social mosaic. From the former ruling party of Assam – Asom Gana Parishad – to the former chief minister of Jharkhand, the other leaders present, reflected the composite cultural heritage of our country. This in itself was a clear message that this Convention reflected not merely the recognition of Indian diversity but to build on the bonds of commonality that run through such diversity to create a much stronger united and prosperous India. Speeches at the Convention convincingly punctured the campaigns of disinformation and insidious communal propaganda currently being carried out by the RSS/BJP. For instance, the RSS/BJP’s efforts to (mis)appropriate the legacy of India’s iron man Sardar Patel was thoroughly exposed as an effort to try and steal a link with the freedom struggle when the RSS deliberately stayed away from the mighty national movement. It is necessary to recollect that it was this very Sardar Patel who banned the RSS following the assassination of Mahatma Gandhi. A government communiqué dated February 4, 1948, drafted by Sardar Patel, announcing the ban on the RSS says: “The objectionable and harmful activities of the Sangh have, however, continued unabated and the cult of violence sponsored and inspired by the activities of the Sangh has claimed many victims. The latest and the most precious to fall was Gandhiji himself”. Even so, how they can appropriate Patel remains inexplicable. On November 14, 1948, Patel’s home ministry issues a press note on the talks that were held with then RSS chief, Golwalkar who made many deceitful compromises. This informs that the “professions of RSS leaders are, however, quite inconsistent with the practice of its followers” and refused to withdraw the ban. A further request by Golwalkar for a meeting was refused by Sardar Patel who ordered his return to Nagpur. It was only on July 11, 1949 that the ban was withdrawn when the RSS buckled and accepted all the conditions set by the government including that it shall remain a “cultural organisation” “eschewing secrecy and abjuring violence”. All ‘conditions’ that it is brazenly violating today. Such a misappropriation of Sardar Patel is part of the overall objective of re-writing Indian history in order to straightjacket it into a monolithic record of the glorification of the “Hindu Nation”. Such an effort is integral to advance the RSS project of the metamorphosis of the modern Indian secular democratic Republic into their version of “Hindu Rashtra”. The sharpening of communal polarisation through fascistic demagogy and the triumph of the RSS project of the `Hindu Rashtra’ will only signal the death of the ideals enshrined in our Republican Constitution. Thus what is at stake is the very unity and integrity of India, preserving and enriching its immensely rich socio-cultural-religious diversity. This cannot be allowed in order to advance the popular struggles for the creation of a better India. There was wide speculation among sections of the media that this Convention will announce the formation of a non-Congress, non-BJP political alternative in the forthcoming general elections. The Convention made it absolutely clear that its primary objective was to strengthen people’s unity against communalism which poses a grave threat to our future itself. The message of the Convention will now be carried across the length and breadth of the country.